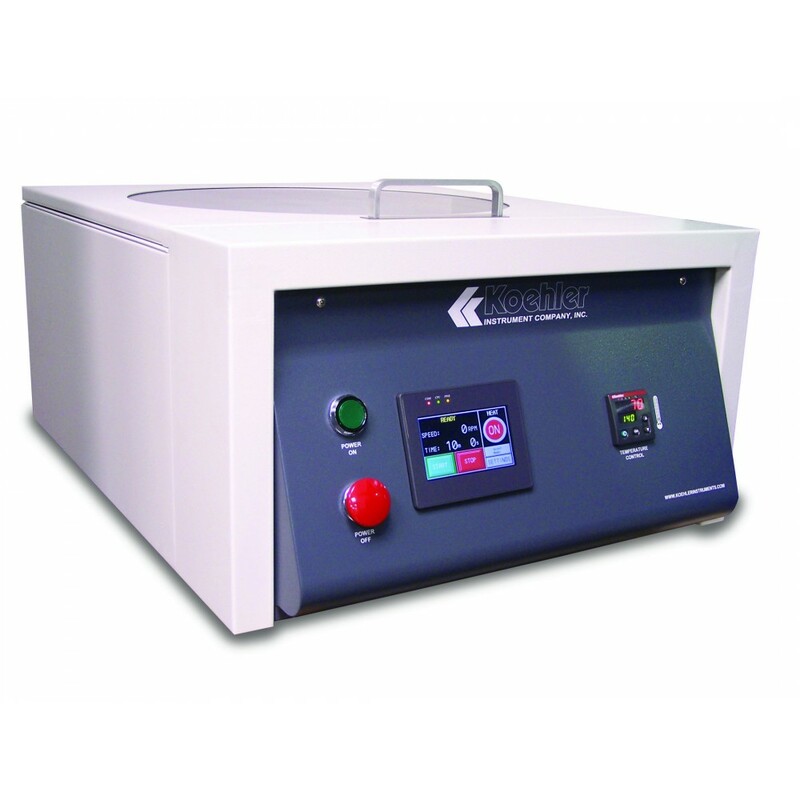 Automatic Heated Oil Test Centrifuge – Koehler Instrument Company, Inc.
Centrifugation provides a convenient means of determining sediment and water content in crude oil, fuel oils, middle distillate fuels, and biodiesel. Also used in determining the precipitation number, demulsibility characteristics, trace sediments, and insolubles in used lubricating oils. Automatic control of acceleration ramp, centrifugation speed, andtiming functions. Fully automatic bench top centrifuge designed expressly for petroleum testing applications. Features a 4-1/2” LCD touch screen control panel. This integrated touch screen can be used to turn the heat on and off, set the duration of the test, set the RCF/RPM values and choose the type of rotor assembly and corresponding glassware to be used during the test. The Servoed motor speed mechanism allows the user to simply set the desired speed and the instrument will attain that speed. This mechanism calculates RPM based on the given RCF and type of Rotor selected. The large, clear, top opening lid provides for easy access to the rotor and tube holders and for cleaning of the unit. The lid has a 18-1/2” diameter viewing window allowing the operator to view inside the chamber for checking the status of the rotor and checking for possible spillage of the centrifuge tubes. Molded PTFE cushions provide for maximum protection and easy positioning of the tubes. Safety Features The Centrifuge comes equipped with a Safety Lockout Mechanism. Upon emergency shutdown the door is locked and cannot be unlocked until the unit comes to a complete stop, the unit is turned back on, and the stop/unlock key is pressed on the touch screen display. Furthermore, the centrifuge cannot start while the door of the chamber is open and the latch is not engaged. The “Nitrogen Purge” feature allows for a slow release of Nitrogen into the bowl of the centrifuge. This feature requires an external Nitrogen Gas source and can easily connect to an Inlet port located at the back of the unit.